PINGTANG COUNTY, China — When hundreds of engineers and builders began clambering up a jagged hill in southwestern China to assemble a giant telescope in a deep, bowl-shaped basin, poor villagers sometimes crept over the sheer slopes to glimpse the country’s latest technological wonder. 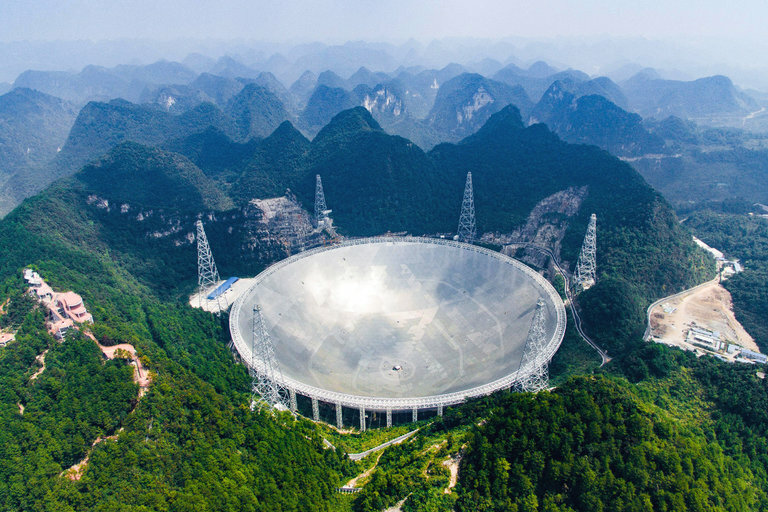 The wok is the world’s largest single-dish radio telescope, and it officially began operating on Sunday, accompanied by jubilant national television coverage, after more than five years of construction. The Five-hundred-meter Aperture Spherical Telescope, FAST for short, is intended to project China’s scientific ambitions deep into the universe, bringing back dramatic discoveries and honors like Nobel Prizes. Maybe even messages from aliens. The telescope, which is in a majestic but impoverished part of Guizhou Province, embodies China’s plans to rise as a scientific power. The dish is made of 4,450 intricately positioned triangular panels and has a collecting area of 2.1 million square feet, equal to almost 450 basketball courts. At 1,640 feet in diameter, it will be roughly twice as sensitive as the world’s next-biggest single-dish radio telescope, the Arecibo Observatory in Puerto Rico, which is 1,000 feet across. Astronomers will use the Guizhou telescope to map the shape and formation of the universe, relying on its large size and a mobile detector suspended above the dish to explore space more quickly, deeply and thoroughly than they can with smaller telescopes. The telescope cost $184 million, recent Chinese state news reports said, although that figure seems unduly modest, given the telescope’s size. To ensure the project remains undisturbed, the government is moving more than 9,000 people. Chinese science is often seen as serving the country’s economic and military expansion, seeking ruthlessly practical dividends. But the telescope shows that the government in Beijing is also willing to spend heavily to propel China into the big leagues in research that offers few direct payoffs, apart from knowledge and prestige. China’s history of subjugation to the West in previous centuries reinforced the belief that scientific prowess is essential for any modern power. And studying the heavens was, after all, an area where China excelled in ancient times. Astronomy, however, also depends on international cooperation. Despite Chinese hoopla about the telescope as homegrown technology, it also uses foreign equipment. The receiver, a crucial part, is Australian technology. Foreign scientists will be invited to work on research, and many of the telescope’s big projects will draw on international collaboration. Even so, not all of the thousands of people being moved for the telescope want to go. “I’ve lived here all my life. My ancestors arrived here in the Qing dynasty over 200 years ago,” said Mr. Huang, the carpenter, who lives in Miaoping village. He said local villagers had complained that the housing they had been offered in a town down the road was poorly built. “We don’t want to leave, but the government says it’s for the good of the country,” he said. In return for the farmers’ pain, Chinese scientists will have a vast and powerful scientific instrument that they hope will make breakthroughs in some of the biggest mysteries of the universe. “We’re definitely aiming for innovative results as quickly as possible, unearthing its potential for Nobel Prize-grade discoveries,” Di Li, a leading scientist on the FAST project, told Xinhua, the state news agency, last year. The telescope is part of an array of projects to raise China’s standing as a scientific power through big, expensive feats of scientific exploration. The space program aims to send an astronaut to the moon by 2025 or later and to land an unmanned vehicle on Mars in 2020. Chinese scientists plan to build the world’s biggest particle accelerator. And there may be more radio telescopes, including in Tibet. Using the new reach of the telescope in Guizhou, astronomers hope to better measure the distribution of neutral hydrogen atoms, like a telltale cosmic dust. “Previous research could only tell us that the universe is expanding,” Zhang Tongjie, a professor of cosmology at Beijing Normal University who plans to use the telescope, said in an interview. If the telescope can be used to survey electromagnetic radiation from neutral hydrogen, he said, Chinese scientists would be well positioned to gain a much more accurate grasp of how fast the universe is expanding. “That would be very significant,” he said. Astronomers also hope to use the telescope to locate thousands more pulsars, the highly magnetized neutron stars that rotate, creating a metronome-like pulse that is a boon to measurements. By better measuring pulsars, and more of them, the telescope could open up a new way to explore the long-elusive gravitational waves predicted by Einstein’s general theory of relativity. Early this year, an international team of scientists announced that it had captured evidence of gravitational waves. But the pulsar research would offer another way to make progress, perhaps confirming and refining that discovery. “This telescope offers the first time that China will have an unsurpassed opportunity to be at the international forefront of deep space exploration,” said Mr. Zhang, the astrophysicist. Most alluring to the public may be the search for extraterrestrial civilizations, from signals that accidentally reach Earth or from messages sent here. The new telescope opens up the possibility that the first human leader to respond to a message from alien life could be Mr. Xi. But alien life is not a focus for now. Initially, the scientists running the telescope will scan the skies to test and calibrate their equipment, and researchers involved in the international effort to explore for intelligent life on distant planets will “piggyback” to sift for signals, Dan Werthimer, the chief scientist of the SETI Research Center at the University of California, Berkeley, which engages in the search for extraterrestrial intelligence, said in a telephone interview. But astronomers said it could be years before the telescope in Guizhou starts making breakthroughs. It could take a year or two for the scientists and technicians to tweak and debug the complex equipment so that the telescope can work at full strength, they said.